Miami Trace’s Lauren Truex (5) advances the ball against Chillicothe during an SCOL match at Miami Trace High School Thursday, Sept. 15, 2016. 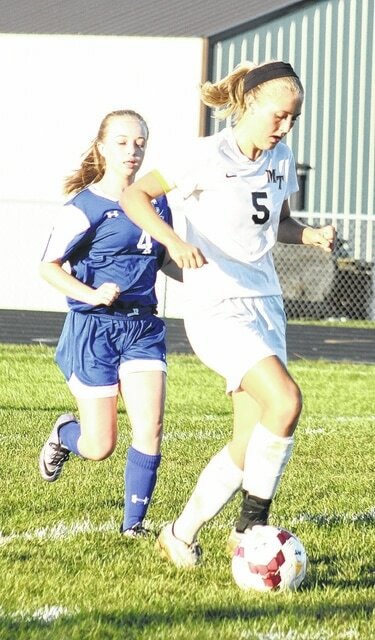 The Miami Trace Lady Panthers were coming off a 7-0 win over their rivals, Washington High School, when they welcomed the Chillicothe Lady Cavaliers for another SCOL match Thursday. Miami Trace continued to show how improved they are, however, in the end, it was a 3-0 win for Chillicothe. All of the scoring in the game came in the first half. The Lady Panthers were able to keep Chillicothe from adding to the advantage in the second half. Taylor Barrett had nine saves for Miami Trace. The Lady Panthers had 13 shots to 12 for Chillicothe. Chillicothe is 5-1-2 overall, 5-0-1 in the SCOL. Chillicothe is tied for first with Hillsboro. Those teams face off against each other Saturday morning. For the Lady Cavs, Payten Davis had two goals. One assist went to Aries Barnes. Lexi Brown scored the third goal for Chillicothe with the assist to Meliah Johnson. “It was a real big, competitive SCOL game,” Chillicothe head coach Tyler Wickham said. “It was the type of game we expected it to be. This is my first year as head coach. I was the assistant coach for the last four years. This is one of the better teams that Trace has had since I’ve been around. Miami Trace, now 2-4 in the SCOL, 2-7 overall, will be back in action Tuesday at home against Unioto at 5 p.m.